>> BUTLER 44, MOREHEAD STATE 6: Duvante Lane scored three rushing touchdowns and carried the ball 14 times for 99 yards to lead Butler over Morehead State in Pioneer League play on Saturday. 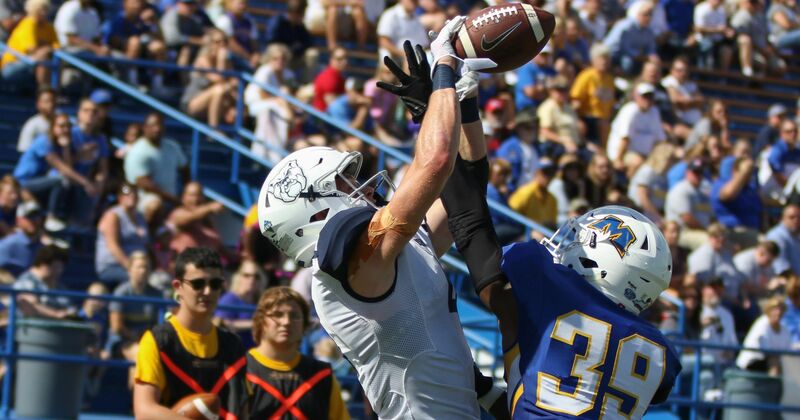 Despite the Bulldogs’ offensive output, it was Butler’s defense that established control early. Xavier Colvin’s sack of Lawson Page forced a fumble that Matt Hawkins recovered for Butler (3-3, 1-2) at the Eagles’ 35-yard line. Anthony Scaccia then ended a 6-play drive with a 2-yard touchdown run to give Butler the lead. Later in the first, Scaccia added a second touchdown with a 19-yard run for a two-touchdown lead. The Bulldogs took a 24-0 lead into halftime. Butler ran for 253 yards on 44 carries and scored six touchdowns on the ground. Moorhead St. (2-4, 1-2) was stymied at the line of scrimmage rushing 21 times for 48 yards. Page threw for 135 yards and average just 5.6 yards per completion. >> NORTH DAKOTA STATE 52, INDIANA STATE 0: Easton Stick passed for 191 yards and four touchdowns before sitting out the fourth quarter and North Dakota State rolled to victory over Indiana State on Saturday. Stick hooked up with Connor Wentz for first- and second-quarter scores and found Dallas Freeman and Ben Ellefson for TDs in the third to put the Bison up 45-0. Stick came into the game with a 188.5 quarterback rating, second in the FCS. Lance Dunn carried it 16 times for 74 yards and two scores. Adam Cofield’s first career TD, an 11-yard run in the fourth, capped the scoring for NDSU (5-0, 2-0 Missouri Valley Conference), which has won an FCS-best 11 straight regular-season road games. The Bison picked off three passes and recovered three fumbles. Lemonte Booker rushed for 104 yards on 10 carries for the Sycamores (0-5, 0-2), who played their first home game in 37 days. >> MARIAN 61, ST. AMBROSE 24: Marian bounced back from last week’s loss to No. 1 St. Francis with a comfortable win over St. Ambrose. The No. 13 Knights gained 626 yards of offense. Marian (3-2) jumped out to a 17-0 lead in the first quarter on a Charles Salary 22-yard rushing touchdown, a 28-yard field goal and a 27-yard pass from Luke Johnston to Johnny William. After St. Ambrose got on the board, Marian responded with 30 straight points. Johnston and William connected for a 26-yard scoring play, Tristen Tonte found the end zone from 5 yards out, Johnston scampered for a 3-yard score, Cameron Fox hit a 29-yard field goal and Maurice Woodard had a 16-yard scoring run. Marian’s Wesley Cook found the end zone twice in the fourth quarter. Johnston finished 15-of-29 with 227 yards and 2 touchdowns. Salary led the rushing attack with 147 yards. William led the receivers with four receptions for 98 yards and two scores. >> UINDY 28, McKENDREE 10: The University of Indianapolis picked up a 28-10 win at McKendree Saturday. The Greyhounds have won 10 straight games dating back to last season. The Greyhounds (6-0, 3-0 Great Lakes Valley) took a 14-3 lead into halftime, scoring a pair of touchdowns in the second quarter. Tuwan Payton got the team on the board with a 4-yard run and Jake Purichia found Aaron Matio on a 44-yard touchdown pass. Payton added a second touchdown in the third quarter to extend the lead to 18. McKendree answered with its first touchdown, but Purichia scored on a 1-yard keeper for the final score of the game. Lawrence North graduate Al McKeller led all players with 114 yards on 21 carries. Purichia finished with 193 passing yards. Alex Kimack was the team’s leading receiver with five grabs for 81 yards. The Greyhounds host Quincy next week at 6 p.m.